In previous years, trancoding services were primarily aimed towards radio stations that had a large number of listeners using dial-up and were unable to sustain a high bitrate stream, however that’s no longer relevant. Despite this, transcoding services have become more popular due to the increasing number of people that are listening to internet radio via their mobile devices. Mobile internet is often slower than normal broadband connections and combined with the higher price per MB used, it makes sense to offer your mobile listeners a low bitrate option. 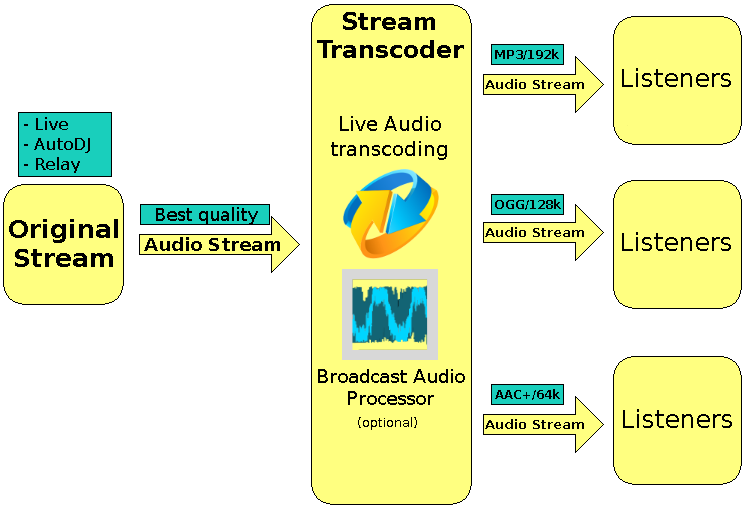 Another way to use Stream Transcoder is to provide the highest quality broadcast and unique sound. This can be achieved by inserting a Stereo Tool broadcast audio processor. An audio stream is taken from your main server, split into multiple bitrates/formats in real time and re-streamed to stream server. This enables you to offer your listeners a wide range of alternatives including high and low bitrates using MP3, OGG, OPUS, AAC and AAC+ streams. This is great news for your listeners that tune in via wifi, mobile or have slow Internet access as they can now listen to a buffer-free stream with no annoying interruptions. They’ll listen for longer and be more likely to come back! Optionally, the broadcast audio processor provides the best sound quality!